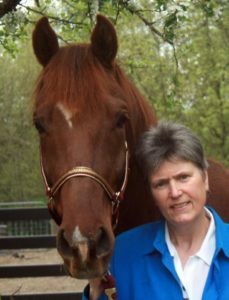 Joyce Korschgen is a Licensed Professional Counselor and EAGALA (Equine Assisted Growth and Learning Association) trained Equine Assisted Professional (EAP) who has been in private practice for 30 years. Though her main specialty has been the treatment of Eating Disorders she was inspired to create Heron Hill Arabians 12 years ago and has been working to promote EAP since then. Her collaboration with Lewis and Clark College and Thomas Doherty has resulted in the development of The Center at Heron Hill: An Equine and Nature Based Therapy and Education Program. She is the founder of Alliance Counseling Center, an outpatient eating disorder treatment facility and now serves as the Director of The Center at Heron Hill. Joyce is also a level one Archery Instructor.